Mandate: Subcommittees are working groups that report to existing committees. 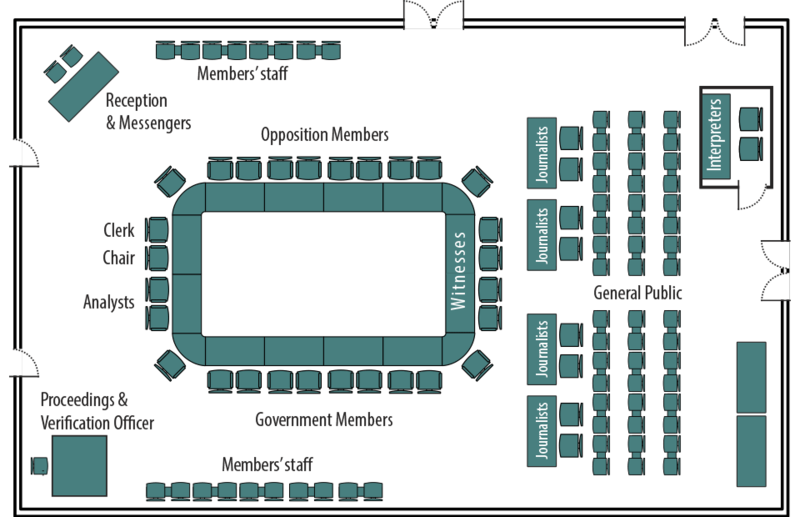 Most standing committees create a subcommittee on agenda and procedure, commonly referred to as a “steering committee”, to help them plan their work, by adopting a routine motion. The Standing Committee on Agriculture and Agri-Food studies bills, government activities and expenditures, and issues related to Canada’s agriculture and agri-food industry. The Standing Committee on Canadian Heritage studies the policies and programs of the Department of Canadian Heritage and the organizations within the Portfolio. These organizations are active in the fields of culture, heritage and human rights. The Standing Committee on International Trade studies and reports on such matters as international trade policy, and the global trade and investment environment. The Standing Committee on Environment and Sustainable Development studies the programs and legislation of Environment Canada, Parks Canada and the Canadian Environmental Assessment Agency as well as reports of the Commissioner of the Environment and Sustainable Development. The Standing Committee on Access to Information, Privacy and Ethics studies matters related to the Office of the Information Commissioner of Canada, the Office of the Privacy Commissioner of Canada and the Office of the Commissioner of Lobbying of Canada, and certain issues related to the Office of the Conflict of Interest and Ethics Commissioner. The Standing Committee on Foreign Affairs and International Development studies matters related to international affairs, including Canada’s foreign policy and development assistance. The government department under the Committee's scrutiny is the Department of Foreign Affairs, Trade and Development. The Standing Committee on the Status of Women studies the policies, programs, expenditures and legislation of departments and agencies, including the Department for Women and Gender Equality, that conduct work related to the status of women. The Standing Committee on Fisheries and Oceans studies and reports on matters related to the federal role in the management of Canada's fisheries and the safeguarding of its waters. The Standing Committee on Human Resources, Skills and Social Development and the Status of Persons with Disabilities studies employment, labour, income security, skills development and disability issues, as well as programs administered by Employment and Social Development Canada. The Committee also administers the Centennial Flame Research Award. The Standing Committee on Industry, Science and Technology studies and reports on legislation, the activities and spending of Industry Canada and its portfolio members, and other issues related to industry and technology capability; scientific research and development; telecommunications policy; investment, trade, small business and tourism; and rules and services that support the effective operation of the marketplace. The mandate of the Standing Committee on Official Languages includes, among other matters, the review of official language policies and programs, including reports of the Commissioner of Official Languages. The Standing Committee on National Defence studies the Department of National Defence and the Canadian Armed Forces, as well as the domestic, continental and international security environment. The mandate of the Standing Committee on Government Operations and Estimates studies the effectiveness and proper functioning of government operations, on the estimates process as well as on the expenditure plans of central departments and agencies. The mandate of the Standing Committee on Public Accounts is to review and report on the Public Accounts of Canada and all reports of the Auditor General of Canada. The Procedure and House Affairs Committee studies and reports on the rules and practices of the House and its committees, electoral matters, questions of privilege, MP conflicts of interest, internal administration of the House, and services and facilities for MPs. Mandate: The Subcommittee on Private Members’ Business of the Standing Committee on Procedure and House Affairs reviews all private members’ bills and motions to determine whether any are non-votable. The Standing Committee on Natural Resources studies bills, government activities and expenditures, and issues related to Canada’s energy, forest, minerals and metals, and earth sciences sectors. The Standing Committee on Public Safety and National Security reviews legislation policies, programs and expenditure plans of government departments and agencies responsible for public safety and national security, policing and law enforcement, corrections and conditional release of federal offenders, emergency management, crime prevention and the protection of Canada's borders. The Standing Committee on Transport, Infrastructure and Communities primarily studies the legislation, policies and programs, and other issues of national importance related to transportation, infrastructure, and Canadian cities and communities as well as the operations of Transport Canada and Infrastructure Canada. The Committee was appointed to identify and conduct a study of viable alternate voting systems to replace the first-past-the-post system, as well as to examine mandatory voting and online voting. Mandate: Subcommittees are working groups that report to existing committees. Most committees create a subcommittee on agenda and procedure, commonly referred to as a “steering committee”, to help them plan their work, by adopting a routine motion. The Liaison Committee deliberates on administrative matters relating to the standing committee system. The main responsibility of the Liaison Committee is to apportion funds to standing committees from the money allocated for that purpose by the Board of Internal Economy. The Standing Joint Committee on the Library of Parliament assists the Speakers of both the Senate and the House of Commons in reviewing the effectiveness, management and operation of the Library. The Special Joint Committee on Physician-Assisted Dying was appointed to review the report of the External Panel on Options for a Legislative Response to Carter v. Canada and, following consultations, make recommendations on the framework of a federal response on physician-assisted dying. The Standing Joint Committee for the Scrutiny of Regulations reviews and scrutinizes government regulations and other statutory instruments.